Completion of this project finally came. 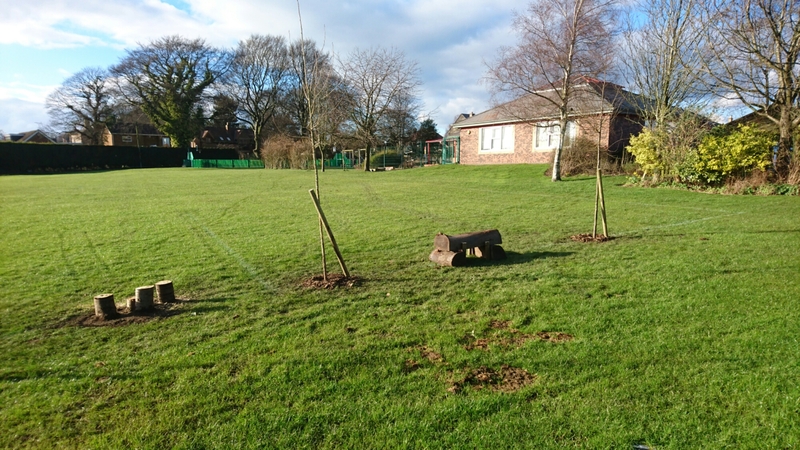 We took one cherry down that was obstructing a street light and public walkway with its branches and in return planted six new trees, this time having a bit more fore thought on their final height and spread, we chose Turkish Hazels and Fastidious Hornbeam, which grow to around 30ft with a 20ft spread over approx 30 years. Not all of the wood went to waste though, we went the extra mile and used the logs to make balance beams and stepping stones for the kids to play on along with carving the stump into a chair.